As the craft beer movement has moved towards the mainstream something of a backlash has begun against those that champion it over the standard mass market alternatives. Indeed, the dismissive use of the term “hipster” is usually not too far from any commentary on the rise in popularity of the craft beer industry and products. To a degree, I am not 100% convinced that there are not indeed some hipsters among the following who’s sole purpose is to stand out from the rest of the beer drinking crowd, “as an individual” however, I would argue that the craft brewers of the world have awakened something in the average generic lager drinker beyond a desire to be different, otherwise the industry would not have persisted as it has. The thing that it has awakened, in my opinion, is a desire for something of quality, produced with attention to detail, that is a little different to everything else on offer and that is more simple in terms of ingredients (resulting in lesser hangovers! )…it is perhaps a question of taste? But what is the definition of a craft beer…and does a strict definition actually matter to the drinker? I’ve been thinking about doing this blog post and its contents for a while, stirred on by something local that I will come onto shortly but what actually encouraged me to write it was an article I spotted this week about a civil suit against the producers of Blue Moon. Without getting into the nuts and bolts of the argument, essentially someone is suing MillerCoors on the basis that Blue Moon is being positioned as a craft beer, where in fact it is produced by one of the worlds’ biggest brewers. Whilst, I get the argument that the “craft brewing” industry supports the little entrepreneur in producing a fine product let us be realistic about the ability for these brewers to become mass market and thus large brewers and employers in their own right! What the craft brewers of the world have done is to become a vehicle for the consumer sentiment by having a sufficient enough impact on the bottom lines of the major brewers by re-introducing a high quality, different, and great tasting fresh competitive force that has caused them to rethink the policy of churning out only volumes of generic industrial and bland product aimed at as big a possible audience and their actions in addressing this should commended because it brings about better quality and selection for all beer drinkers. I would argue strongly that what matters to the drinker is the high quality and variety of the product and if the major brewers can lend some of their considerable weight (and production capacity) to making that happen then all the better. Let’s not forget, that Guinness have actually been one of the much maligned pioneers of attempting to diversify the drinkers palates and product mix on offer in Irish bars for more than 30 years at this stage, from Guinness Light to Breo, Guinness Draught Bottles, The Brewhouse Series (Brew 39, Toucan…) to Guinness West Indies Porter. I say much maligned because the products invariably disappear into obscurity within months however it would be difficult to argue against their credentials as a producer of consistently high quality product on a global scale and the depth of their experience. So to answer my question, does it matter if a beer is “craft beer” or not by definition of who produced it? I would argue that it doesn’t matter at all to most ordinary punters, what matters is that the emergence of a sizeable craft brewing industry has, provided diversity for the the palates of the beer drinking community, and also forced the larger brewers to take note of changing consumer behaviours and demands and put renewed focus on quality of the product that they are producing….and that is in everyone’s favour! For the record, Dublin Porter gets a 4/5 and Smithwicks Pale Ale 4/5 too! Running an airline costs quite a lot and whilst Aer Lingus is profitable currently it is not that long ago that they were loss making and in the cases where losses are being incurred then there is no payback to the shareholder community. Further, aviation is an expensive industry from a capital expenditure perspective and Aer Lingus’ incoming Chief Executive has already stated this week that he believes that they will require a capital investment of $2 billion over the next decade, this investment will either come from loans which will need to be financed out of profits (and hence no dividends) or from further shareholder investment. This is where I have a real problem…what business does a state have in investing in the commercial drivers of a 75% private business and furthermore, how could a government with bigger investment challenges in terms of social services possibly prioritise investment in aviation CAPEX whilst our public health system crumbles under the pressure of years of underfunding and lack of investment resulting in intolerable suffering among society’s most vulnerable…..Sorry, no question for me where the priorities should lie! Cashing out now for the government would mean an immediate inflow for the government for investment where most needed. There appear to be two problems here. Firstly, SAS got 50 million for a pair of these when they sold them recently and by that valuation those that Aer Lingus hold are worth (allegedly) €1.3bn but is it a problem is it that they are undervalued in the IAG bid or that they are of strategic value in terms of connectivity? If it is in fact the connectivity argument that is the be all and end all then how can any value be put on these slots, if not and everything has it’s value why would Aer Lingus market valuation not reflect this? Secondly, I really have to take issue with the “importance” of the Heathrow slots. At a point in time, pre open skies, Heathrow was the be all and end all for connectivity for Irish air travellers, however, I am really struggling to see the value of Heathrow as a hub for Irish air passengers given the frankly enormous range of international routes now available out of Dublin (including to other major hub airports globally). From personal experience, using Heathrow as a hub is something I would avoid at all costs, it has simply become too big and cumbersome and far too much hassle to make it usable without hours of changeover time. In terms of direct connectivity to what is unquestionably one of the world capitals, you have to go back to the open skies argument again, Dublin has never been as well served in terms of connectivity to all of London’s airports. There is huge capacity to serve the undoubted demand that exists on the route, apparently the second busiest in the world, so it is inconceivable that IAG would withdraw services with high load capacities, and even if they were to do so there are a string of other airlines looking to service Dublin to Heathrow, Gatwick, Stansted, Luton, London City and Southend, some of whom are increasing capacity and currently launching new services…. Given the huge capacity challenges in some of the British hub airports, geographical proximity to Ireland of most of the UK’s major cities and towns, and US pre-clearance facilities, Irish airports are potentially a solution to major routing headache for IAG and an opportunity to add value to their services. It has been reported that there are already 1 million UK residents transiting through Dublin Airport T2 each year, imagine the potential for growth in that area with IAG’s support in terms of delivering the transit customers, indeed huge numbers of Spanish travellers to the US are already transiting in Dublin each year. This has repeatedly being highlighted as a challenge to any IAG takeover of Aer Lingus. However, it should be borne in mind that where there is a public service obligation, someone will always be able to service those routes and where there is commercial return or opportunity the commercial airline operators will seek to exploit them….simply look at the growth that Ryanair has been able to deliver to Shannon in recent years. If no commercial merit or public service subsidies are available on routes from these airports then its clear that Aer Lingus (as a commercial airline) is not going to continue to operate services from them. Lastly, it is unquestionable that IAG see Aer Lingus a true valuable addition to their stable of independent brands (BA, Iberia, Vueling) and that there are natural synergies in terms of the business reach of Aer Lingus to those of IAG. The alternatives for Aer Lingus are to attempt to stand alone in an increasingly consolidated space and try to compete against the buying power and economies of scale possible from the major international groups like Air France – KLM, Lufthansa etc or to put together a multitude piecemeal code share agreements with other international groupings, whilst attempting to fend off the threat of the budget carriers that have now got enormous scale…Considering all these likely scenarios it is difficult to see how Aer Lingus can confidently continue to operate in this space. I’m usually a fan of IPAs and seeing the sheer number of bottles of this stocked in my local off-licence gave me an indication that it was probably pretty popular / either that or someone was pretty confident that they would sell a lot of it. After the first bottle I had caught the bug somewhat and this has quickly become one of my fail safe beers that I always make sure to have in the house. Brewed in Banagher (of Pure Mule fame) this is one of a range of beers from the Bo Bristle Brewery, who appear to be doing very well if number of places its available is anything to go by! As IPA’s go its really smooth, yet still hoppy with that citrus finish and a great beer for an evening at home at the end of the working week…presumably it’s not too bad out in the pub either! For anyone that knows me they will be aware that I am a massive fan of the beers that these guys are producing in Rathmullan, Donegal. Ind eed I did fret somewhat a couple of weeks ago when the supply in the 2 local off licences of choice looked to be drying up (thankfully it was a temporary supply issue but that didn’t stop me stocking up when it did come back in just in case!) 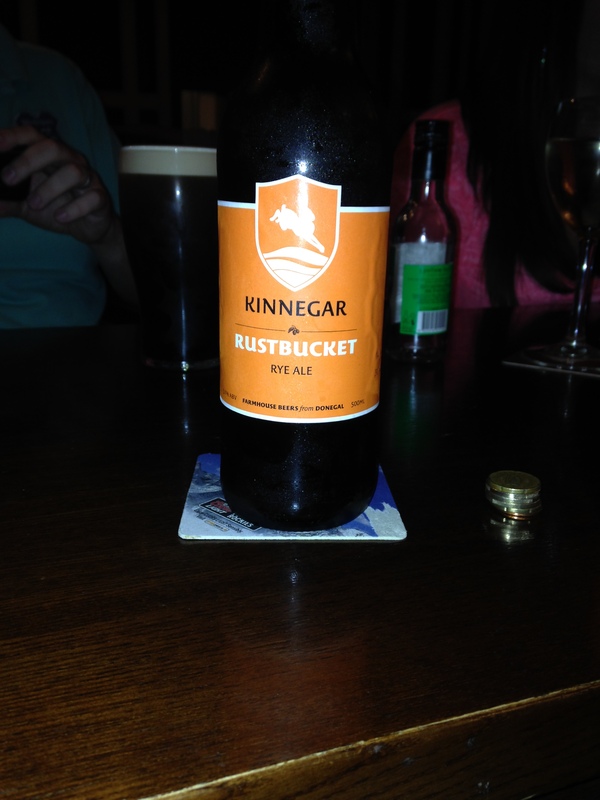 My favourite currently of the beers these guys are producing is the Rye Ale Rustbucket. A big shout out to my local that has been selling this in bottles for the last number of months, but anyway I digress! The thing that I really like about Rustbucket is the really distinctive flavour and colouring that the Rye gives the beer, it adds a real complexity to the flavour (which also serves as a reminder the respect the strength of it!) but it remains very smooth to the finish making it really drinkable. 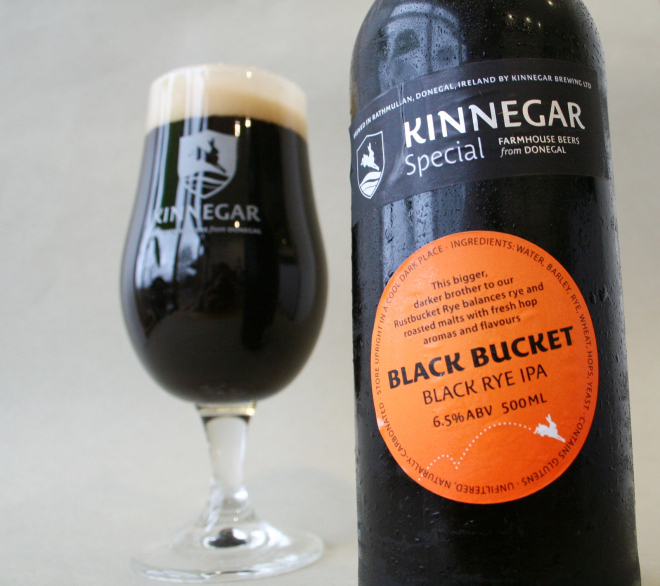 Being a fan of this, imagine my excitement (perhaps a little too much so) when I discovered that Kinnegar were unleashing another Rye variant called Black Bucket, especially for the All Ireland Craft Beer Festival back in September, so much so that I dragged my willing accomplices directly to the Kinnegar bar as soon as we got there and used both of my free tickets on it. Slightly stronger, in terms of alcohol content at 6.5% again it deserves respect, and produced with black rye it has a really distinctive black colour, bursting with Rye flavours but retaining a level of hoppy crispiness I would have quite happily stayed drinking that for the night! So in the unlikely event that anyone from Kinnegar reads this, please give me some hope that it wasn’t a once off and will be available more widely soon. Perhaps the best discovery of the Craft Beer Festival for me. Again these guys are only brewing since June and what really drew me in in the first place is when I spotted that they were based in the Cork Gaeltacht of Ballyvourney, a place that holds lots of happy memories for me as a teenager in the Gaeltacht for 3 consecutive summers. Stag Bán, the name derived from the story of St Gobnait and the nine white deer in the Ballyvourney area, is a crisp and really fruity IPA. It retains a lot of the hoppiness of a good IPA yet also has a distinctive flavour that is not quite citrus but more something of a subtle peach flavour. As I said, probably the discovery of the Craft Beer Festival for me, and Imagine my delight when I discovered literally a couple of weeks after the Craft Beer Festival that it was available in both of my local off licences. If you can get your hands on it you definitely won’t regret sampling this and at the same time supporting industry in the Gaeltacht…doing your bit for the language one beer at a time! When out for a few drinks, I am usually not averse to a few pints of the more mass produced Black Stuff however the time generally comes where either I’ve reached a point of fullness where I can’t go on, or we reach an establishment where its not advisable to continue on that path at which point I usually struggle to find an alternative! A number of months back on a sunny Sunday of a bank holiday weekend, I found myself out in town with a willing accomplice mid-afternoon and after a few “nice pints” we decided to try somewhere else. Finding ourselves perched at bar in another establishment (about 100 feet from the previous place) awaiting the start of the Sunday evening jazz that we discovered was also on there we decided to try The 5 Lamps Lager, which was calling out to us from behind the fridge doors. As beers go I am not a big lager drinker although I have to say I really enjoyed the 5 Lamps Lager, but looking for something a little more akin to the stout that went before it the barmaid suggested that I try Blackpitts Porter from the aforementioned 5 Lamps Brewery. For me this is a great great beer from the bottle, it’s a porter but not in the creamy draft stout vein as Guinness but more in the style of Guinness Extra Stout. Best drunk nicely chilled, this beer is slightly bubbly with a mild yet unmistakably roasted barley flavour, it is a very dark colour and not dissimilar to Guinness Black Lager. Definitely one worth trying, great from the bottle and easy enough to drink at lager drinking pace! So that’s me for the moment, let’s see if I can keep up the volume of content! I need to get some further research in in order to have something to write about so (if anyone reads this) I’d really welcome your suggestions as to where I go from here! As always, in the even less likely event that anyone wants to send me some samples I am more than open to that too! As someone in a TV ad once said, “Ireland is a small economy on the periphery of Europe”, we had decades in the last century of attempted self-sufficiency and economic protectionism….and guess what? It failed as an ideology! The result? Economic stagnation, massive unemployment, rural depopulation, urban decay and enormous levels of emigration. In the teeth of this economic stagnation, Irish governments took hugely brave and costly moves in introducing free secondary and then free third level education creating a more educated and skilled labour force, setup government backed training schemes (the fact that some of these failed is an irrelevance with respect to the initial intent) and ultimately played a little fast and loose with the corporation and other business tax rates, taking massive gambles with regards to lowering corporation tax rates to 12.5% for example on the premise that this would help to drive more foreign direct investment versus whatever would have to be foregone from the previous level at a higher rate. This was further empowered by the creation of state bodies with a remit of driving FDI by roadshowing the country globally with the support of senior government ministers. Furthermore, in order to make up the short term tax shortfall the Irish public paid through the nose with exceptionally high levels of personal taxation and neglected social services in areas such as health and more recently through the governments protection of the European banking systems by making private debt in Irish banks sovereign debt in order to prevent their collapse. Additionally, Ireland has remained committed to the Euro despite its central bank governance working almost diametrically opposite the best interests of the Irish economy in terms of interest rate policy in order to maintain Eurozone membership as an attractive proposition! In the light of the level of work and sacrifice (bearing in mind that we have just again begun to exit very straightened times) the fact that Ireland can boast of its attractiveness to global technology and pharma companies in particular and notable domestic success stories such as Ryanair (one the top Airlines in Europe by profitability and customer volume) is something that Irish citizens should continue to be exceptionally proud and protective of. The fact that the best measure of success of the irish economy is GDP as opposed the more commonly used metric of GNP is testament to the importance of FDI in Ireland. Which brings me to the crux of my argument (rant), the results of the economic and social investment of the last number of decades should not be fair game for political point scoring from our larger international neighbours. In recent days we have heard stories of the German finance minister being unhappy with patent tax breaks that are causing certain German companies to offshore certain activities in other EU countries, President Obama come out publically against the practice of tax inversion and David Cameron complaining that Irish corporation tax rates put Northern Ireland at a competitive disadvantage when it comes to attracting FDI….and my response, which covers all these scenarios, is this; the economic conditions created in certain geographies, and Ireland in particular, were done so at a cost and a risk to those that live in and govern those economies, if others have a problem with this there is nothing stopping them from similarly rolling the dice and taking the chance to create those opportunities themselves. In short; if German businesses are offshoring certain business elements to capitalise on more preferential tax regimes then perhaps there is something that should be amended fiscally to retain that internally; if Mr Obama has a problem with the practice of Tax inversion perhaps he should look to create the conditions domestically so that those businesses do not have to seek this entirely legal loophole and lastly; if Mr Cameron has a problem with competitiveness in attracting FDI in Northern Ireland then he should devolve power to the local executive to set corporation tax rates and invest in the regional infrastructure that is badly needed to enable it to compete. So why are these leaders not following making these decisions and opting for the route of attempting to coerce others around to their less successful policies? Well, it’s probably down to a number of factors but for me it is perhaps interesting to see that in all of the referenced examples there is pressure on their political powerbases, most notably in Mr Cameron’s case from the more conservative elements of his party obsessively concerned with loss of power to the nascent UK Independence Party which is euro-sceptic and primarily concerned with national identity and national sovereignty fostering an “us against everyone else” competitive stance. But then again perhaps it’s easier to blame someone else rather than look at what is in your own control that you haven’t done…. My first experimentation with Craft Beer came about around about 7/8 years ago on a trip to visit the folks who were living in western New York State at the time. Being extremely fussy about his choice of beers and having a dripping disdain for the industrial beers that invariable are common place in “lite” form in the US, I always wondered how the old man would get on when they first relocated to the US. However, I got my answer when on the first full day there he took me on a trip to see the local craft beer section of the local supermarket. To say my narrow mind (on the subject of US beer) was completely blown by the sheer scale and variety of the craft beers on offer there is an understatement, walk in fridge aside, the layout of the dedicated area of the supermarket with specific sections for different types of beers and different regions (much like we have become accustomed to with wine in Irish supermarkets) gave me a real appreciation of the massive demand for really high quality micro-brewed beer and also the opportunity to begin sampling the same myself! Fast forward those 7 or 8 years and I found myself wandering around my local off licence of choice, that does a fantastic range of craft beers, wondering what to sample that evening. Crippled by indecision as a result of the choice I took the easy option and picked up a six pack of Blue Moon (not my top choice of beer but familiar because of the US experience and at a tenner for six it eased my indecision to a degree!) and tipped over to the counter. The great thing about said off licence is that it is staffed by the bar staff so they know a little about beer, so spotting my choice of purchase and the fact that I was in deep thought not three minutes beforehand about what it was exactly I wanted, the barman suggested that I try some new stuff that they had in, brewed “by some American chap in Donegal”, as “it’s a tasty oul drop”. Working on the basis that he probably knew what he was talking about I took a selection of Limeburner Pale Ale and Scraggy Bay IPA (and also the six pack of Blue Moon just in case). 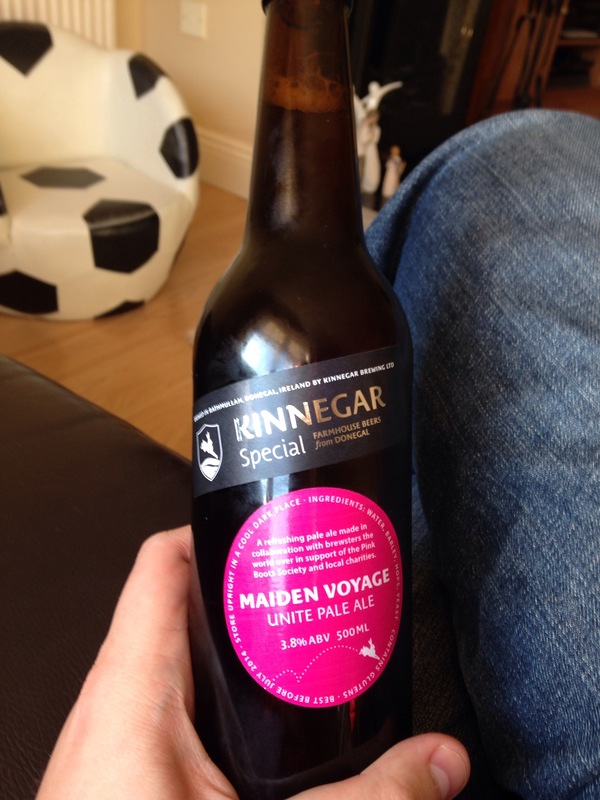 Kinnegar Brewing are based in Rathmullan Co. Donegal and brew a variety of really nice Ales, a Porter and some seasonal brews. It’s still on my list of places to visit, but as I understand it, this is a true micro brewery in terms of volume and setup but at the same time is producing and impressive array of beers. But back to the beer…. I started my sampling (read slugging out of the bottle) with the Limeburner Pale Ale. I’m no expert (as you can probably already tell) but for me this was a solid Pale Ale, a little hoppy and entirely drinkable without being spectacular. Having had it subsequently I would say that it was perhaps too cold on that first occasion trying it out which kind of smothered the hoppiness. However, I subsequently have sampled some of a special batch call Unity Pale Ale brewed again by Kinnegar and it for me was probably slightly better, despite being lesser alcohol content, as it was a little crisper. 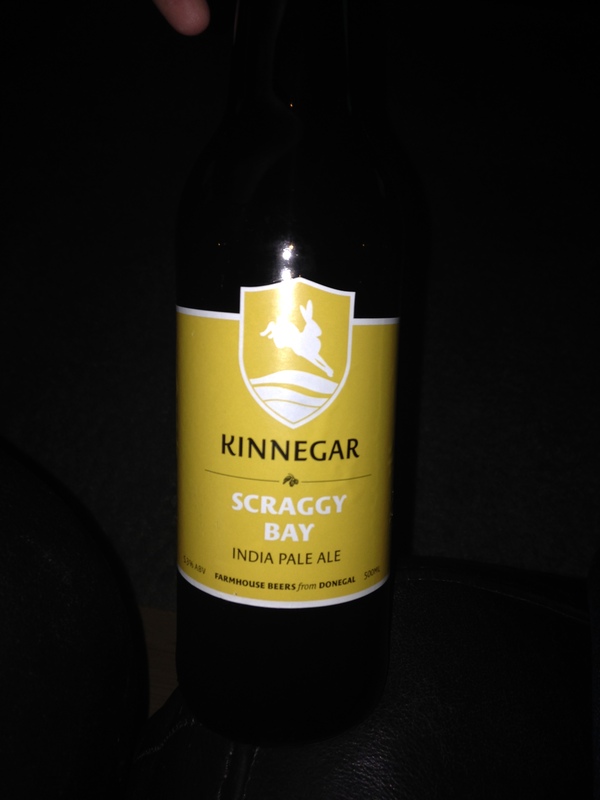 Following on from the Limeburner, I next sampled Scraggy Bay IPA. This one was a real winner with me, slightly stronger, hoppier taste that is a little difficult to describe aside from saying it was slightly sweet to taste with an almost crunchy finish. This was certainly way more to my liking and is certainly in my top 5 beers of all time in terms of taste and finish. Following on from my initial exposure I had the good fortune of meeting the guys from Kinnegar at Bloom in the Park. After spending an hour doing the food bits of the festival, making a pig of myself with the free samples, and rapidly running out of opportunity to avoid the flowers / garden-y bit of the festival I spotted the craft beer marquee on the horizon like a shelter for dehydrated blokes desperate to avoid looking at gardening stuff that would inevitably lead to manual labour in their own gardens and make a break for it (with my 2 year old in tow). I appreciate how this probably looked to any bystanders, slightly relieved looking bloke half sprinting with a buggy to the beer tent at 11am in the morning, but it did give a good opportunity for a chat with the guy from Kinnegar who was just setting up and get an understanding of their range of beers and a first hand explanation. I won’t pretend to remember anything that was said as I was in a state of delirium from the excitement of the opportunity to buy beer, the fact I was putting off the gardening bit for a few minutes and the lovely Jenny telling me to buy a few different beers to bring home, but it did give me something to think about in terms of my next “sampling”. At this stage I am rambling a little based on the outpouring of admiration for this beer but bear with me…. The weekend after Bloom, I found myself in the local with Jenny, the same local as the aforementioned off licence, and she spotted that they had Rustbucket Rye Ale on special offer in the lounge. I am not usually a massive fan of “Rye” anything but times may be changing. I can safely say I had a beer epiphany that night. Rustbucket is a distinctly hoppy, yet balanced ale with no killer aftertaste and a really nice sweetness that is not overpowering or sickly but definitely different. It has a slightly red hue when poured but I have to say I really enjoyed it straight from the bottle. What’s more, after quite a number of these, I felt fresh as a daisy the following morning, (and with 2 toddlers, my mornings start early!) So, this is without doubt probably my favourite beer of the moment….if only it were more widely available!! And if you get a chance, and you can find it on draft, give the Yannaroddy porter a try…I only had a small sample and I could be very much tempted to try lots more if I could get my hands on it on draft!